Happy New Year folks! I started these monthly moodboards mainly to keep my thoughts on the straight and narrow and for the new year I have decided to switch things up a bit by focusing on what's happening around me. This month sees the first lot of big building work happening in our house, walls will be removed and things should start to look a little more how we dream them to be - if you need me I'll be up a ladder roller in hand. After the indulgences of Christmas and New Year, I will definitely be making a real effort to eat healthily again, Leon cookbooks are the best for healthy/tasty recipes. I've been so busy the last few weeks that I haven't prepared any new projects (eek!) but don't fret I have a few ideas up my sleeve that I will get working on asap. I really want to get that red and white fabric made into a skirt and finish planting some bulbs. 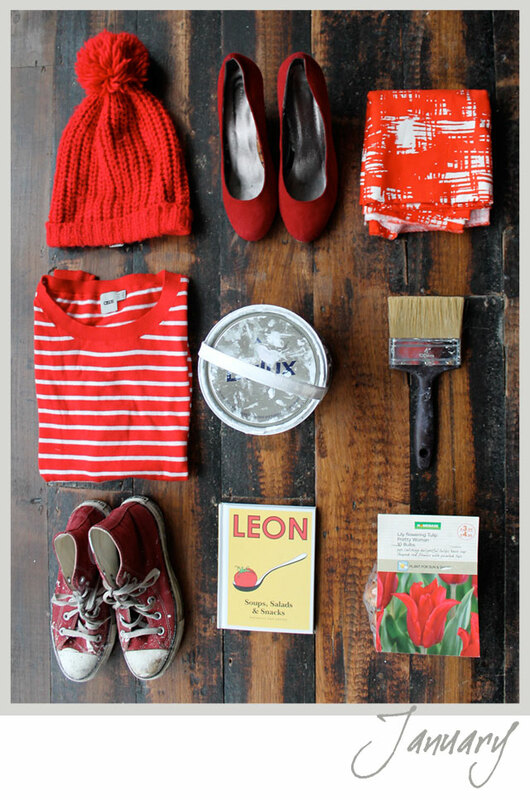 This month I'll mainly be wearing red things. What's on your to do list for the month? I love this real life mood board. Good luck with the building works. Great mood board. Love those floor boards too! What a fab display, just perfect for January. I'm itching to get sewing some things too, having been far to lazy over Christmas to do any! Good luck with all your DIY plans.